Session 4 – April 16, 2018 – UofU Osher – Earth Science Outside. Meet at: the bench overview at Popperton Park. Address: Approximately 410 N Virginia St, SLC, 84103, about a block uphill from the intersection of Virginia Street and 11th Ave. NOTE: Park along the street, I suggest on the “houses” side of the street (north side) so vehicles don’t block our view. NOTE: No walkabout today. We’ll have lawn chairs, and there’s a bench. If you have a favorite chair it’s fine to bring it. NOTE: Safety first. 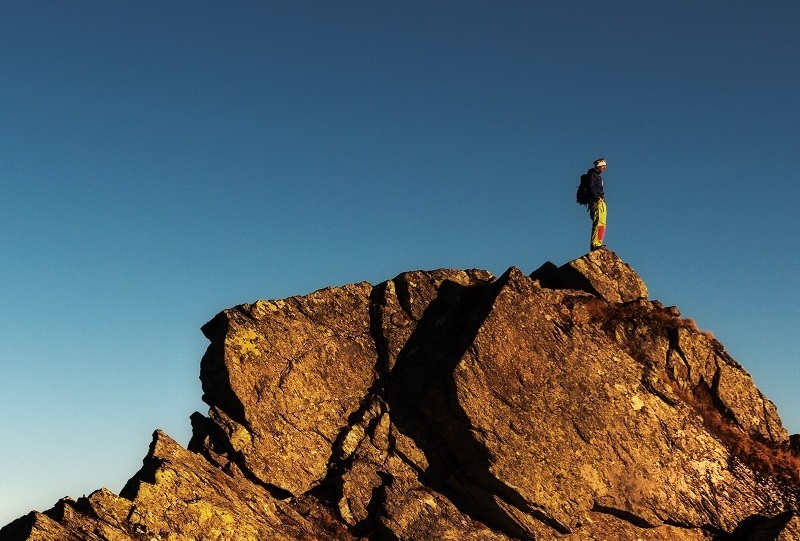 ALL outdooractivities have inherent safety concerns. Be prepared with sensible shoes,clothing appropriate for weather (the forecast is WINDY), etc. SAFETY is a group endeavor. Speak up for safety! There’s never been an issue at this site, let’s keep it that way. 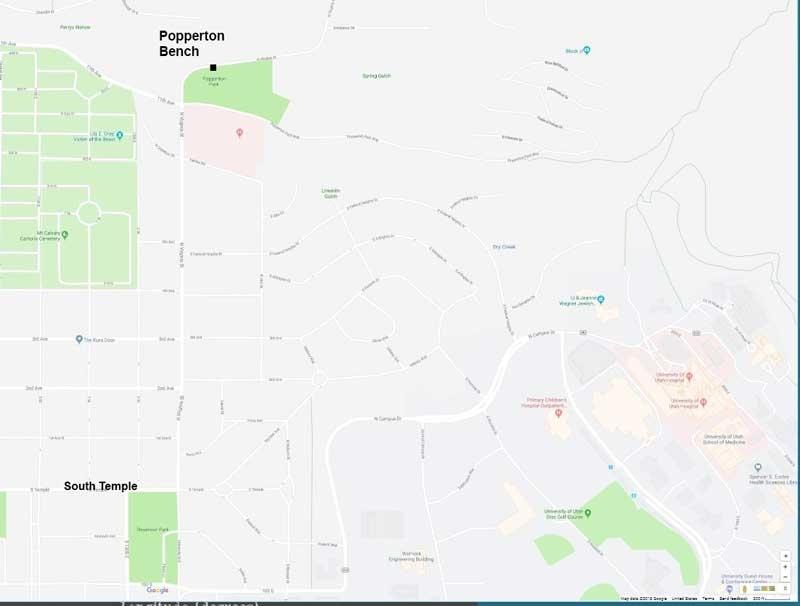 Map showing location of the bench of Popperton Park. Drive north on Virginia Street and just keep going! Drive, safety first but be mindful of topography. Image modified from Google Maps. Popperton Park’s Overlook Bench, modified from Google Maps, 2018. No alternate site will be posted until we know for sure bad weather. Weather looks windy but Okay. But check back the Sunday as the weather is erratic. Repeat to remember, Remember to repeat: Five steps toward the JOY of landscape literacy. Today we focus on Steps One, Two, Three, … and Five. Step one (topic of Session 1): look around. Be mindful of patterns. Breathe deeply. Step two (Session 2… try your skills today, breaks in slope? ): Look deliberately at patterns of shapes of landforms. PATTERNS… Deliberate awareness of landform shapes and consequences. Step three (Sessions 1, 2 AND 4, today! ): Look deliberately at patterns of materials, specifically sediment versus bedrock. Today we study the present, meaning the evidence of Chapter 9 – Now! Stretching west. The evidence of this chapter consists of LANDFORMS and SEDIMENTS. Step four (Session 3, Parleys… and every session thereafter): Look deliberately for patterns in bedrock. Be mindful that bedrock of Salt Lake County represents past chapters of Utah’s geologic history. Some of those layers of bedrock have been buried for millions of years and have only been exposed because tectonics has dropped the valley. All the bedrock you see is older than the beginning of the spreading of the Basin and Range (about 22 million years). QUIZ yourself: how do we know that? Think about what you see today. Focus on the present. 2 PM — Major concepts: Erosion versus deposition. Environments of deposition. Evidence of the role of water on Earth’s surface. Participants should be adept at taking their time to relish Step 1 of Landscape Literacy: PATTERNS. Mindful moments. The patterns of the basins and ranges of the Basin and Range should make sense. They should be able to explain ranges as relatively high places due to the down-dropping basins. Participants should be able to practice Step 2: Deliberate awareness of PATTERNS of shapes of landforms and the role of water shaping them. The concept of erosional surfaces (associated with landforms that are becoming smaller due to erosion) versus surfaces on depositional features should feel intuitive. The role of water as it shapes landforms cannot be overstated. Participants should be able to imagine the role of water across any place they think about… meaning, participants may not be “right” but they will be able to imagine in the context of today’s diverse environments of deposition and Lake Bonneville’s environments of deposition. Participants should be able to apply rules for “relative age” meaning younger than / older than to landforms and sediments seen from Popperton Park. What sediments do you see… or know they must be there? View west, detail, from Popperton Park. AWolcott, 2018. View far to the south. Look south from Popperton Park and identify diverse environments of erosion and deposition. 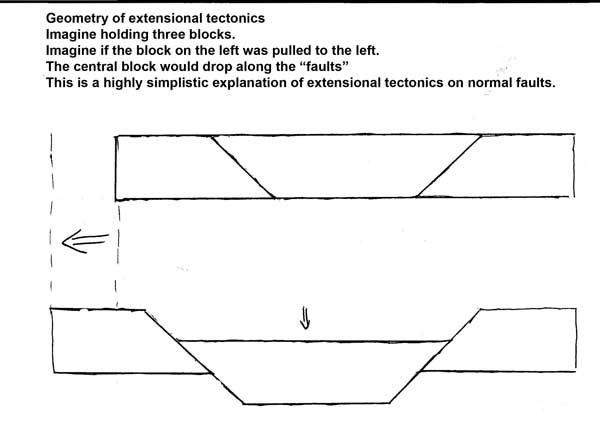 Repeat to remember: Tectonics Rules!! Content: Earth’s materials… there are two types of materials. Bedrock and sediment. 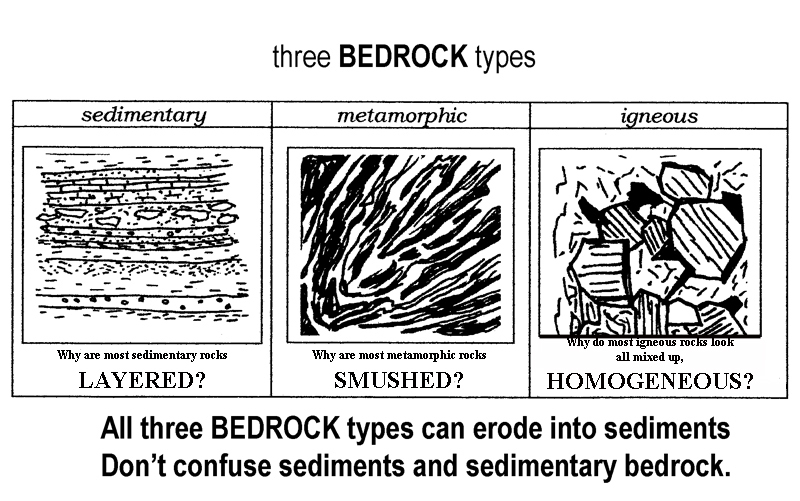 Content: All sediments come from bedrock. 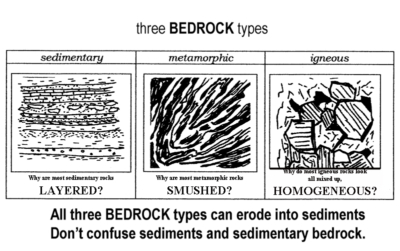 Once they are separated from the bedrock and moved more than a couple inches by wind, water, glacial ice, ground failure of humans, we call the loose material “sediment.” Please avoid saying “igneous sediment” and say instead “sediment that came from igneous bedrock.” Why do I teach this as hugely important when others don’t? Because understanding of processes leads to greater comprehension than being able to identify the names of rocks. 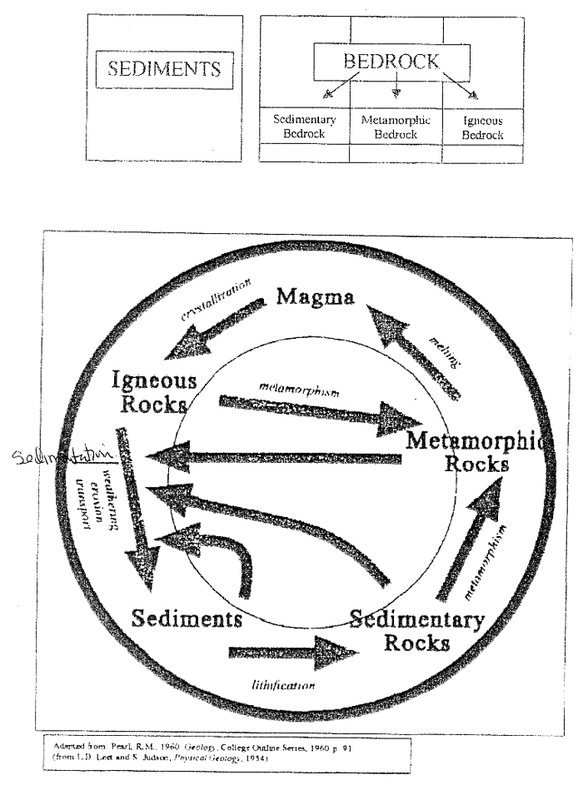 The process is the rock cycle with its diverse sub processes. Today we study the processes of sedimentation: how bedrock and sediments get reworked by weathering, erosion, transport and deposition to become deposits of sediment. Weathering is the loosening of materials from bedrock but does not involve picking the materials up (erosion), moving them (transport), and dropping them (deposition). Imagine: what do the rock materials in a stream look like? For example: how do the sediments at Alta’s Little Cottonwood Creek differ from those of the Jordan River downstream? What about a lake? What shoreline processes act along the shores of lakes you know about such as Great Salt Lake? What about an ocean? Have you been to beaches of Oregon? South Carolina? the Mediterranean Sea? Think about the contrasts. How about to the shores of Lake Michigan or Lake Superior? Content: Lake Superior’s environment today is the modern analogue to Lake Bonneville’s environments of deposition during the Ice Ages. Sand becomes sandstone. Trick question: where in Salt Lake County are there sand deposits? The muds of coastal floodplains become shale. What kind of bedrock could the muds under Great Salt Lake become? Stream deposits with pebbles or cobbles (melon size) become conglomerates. Stream deposits with almost exclusively sand can become sandstone. Where in Salt Lake County are there stream deposits? If you had to guess the future, which of the following stream environments of today will become the bedrock of the future and why? (1) the Jordan River where it enters Great Salt Lake; (2) the Jordan River where it enters Salt Lake County from Utah County? (3) Little Cottonwood Creek’s cobbles at Alta? (4) The stream deposits of Parleys Creek at the mouth of Parleys Canyon? Of course I am interested in your logic. Handout – just this image in gray scale. Look south from Popperton Park and identify diverse environments of erosion and deposition. A Wolcott, 2018. Step 1. Breathe! Notice patterns of bedrock and sediment in the foreground (this site is more complex than it may appear). How might you figure out how high the Ice Age Lake Bonneville once was in Salt Lake County? Step 4: Apply the three rules of relative age: Superposition, Cross-cutting relationships, Tilted layers versus not tilted. Enjoy recognizing those relationships: For example, If there are gullies into the sediments of Lake Bonneville here at Popperton Park, what does that indicate to you? Add other relationships of younger / older that you see here or might look for. By the end of Session 4 here at Popperton Park, participants will have some confidence, not excessive, but some confidence as well as some insecurity with interpretations of relative age. Participants will comprehend the rules of relative age. Congratulations should you appreciate the challenges of figuring it out! Quiz… and then add some questions of your own. 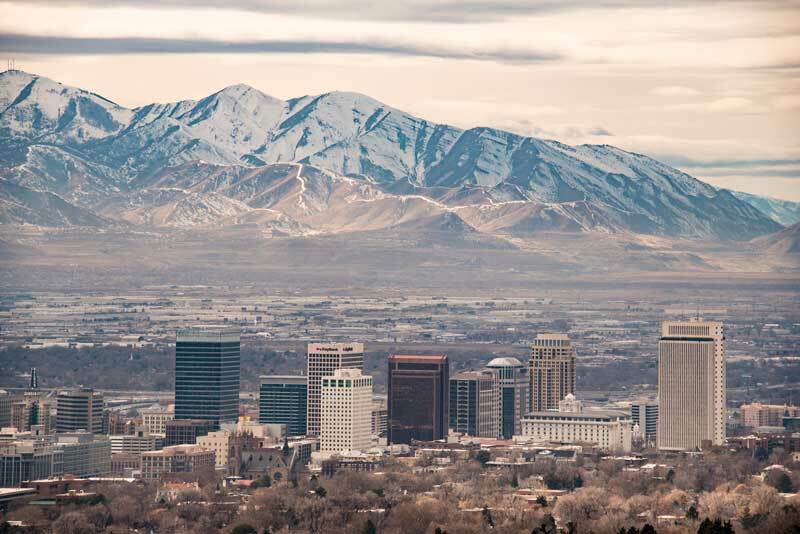 What evidence indicates the sediments in Salt Lake Valley, and in the canyons today are younger than the youngest bedrock of the valley and the canyons? 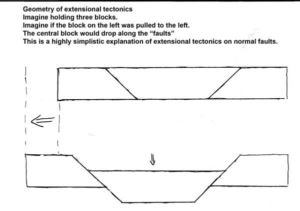 What evidence was there that the tilting of the rock units of the Oquirrh Mountains happened long before Lake Bonneville? What evidence would you look for to determine whether faulting along the Wasatch Fault has happened more recently than Lake Bonneville’s highstand shoreline? How would you figure out what the environment of Lake Bonneville was like during the Ice Ages. Content: We’ll talk more about Great Salt Lake and Lake Bonneville. Here’s an image that contrasts the two… from Utah Geological Survey Map 73. Don R Currey mapped these levels in the field. What evidence did he use?… or would you use? 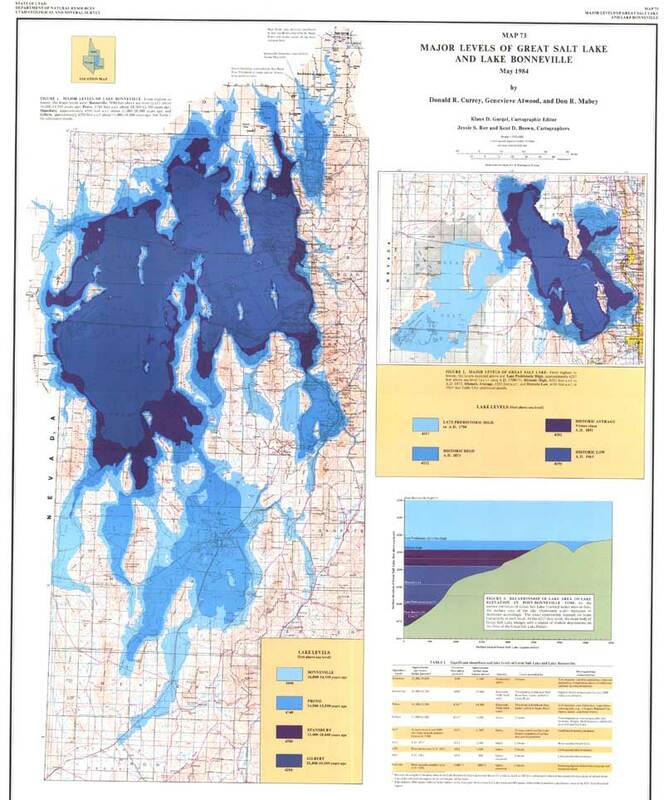 Major Levels of Great Salt Lake and Lake Bonneville – mapping by Don R. Currey, Map 73, UGS, 1984. Next session, Session 5 – Next to the final session… starting to pull it together.